Struggling to get your vegetable-hating children to be healthy is a constant struggle for a lot of parents. I feel awful for my own mom, who had to deal with daily tantrums over everything that wasn’t macaroni and cheese. There are a few things that can help you sneak in more vegetables with your kids (smothering them with cheese, anyone?) 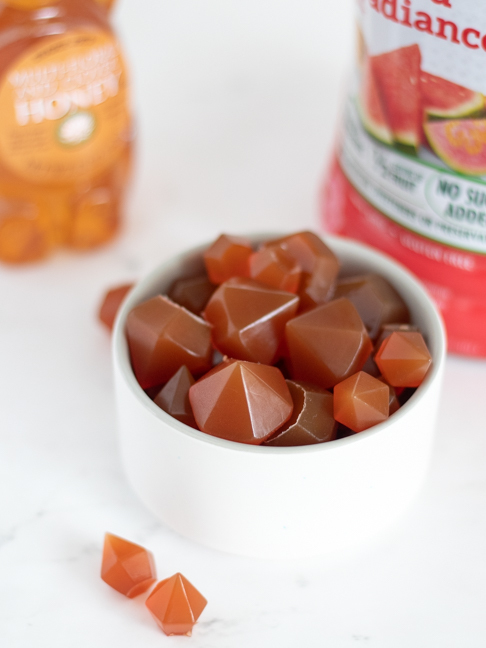 and I’m excited to share one: fruit and veggie gummies! 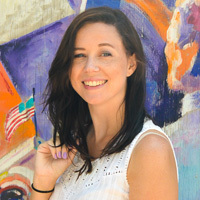 Even as an adult, I know I don’t always eat enough vegetables, so I drink fruit and vegetable juices to help make sure I’m getting the proper nutrients, so I thought, why not find a way for kids to enjoy it too? 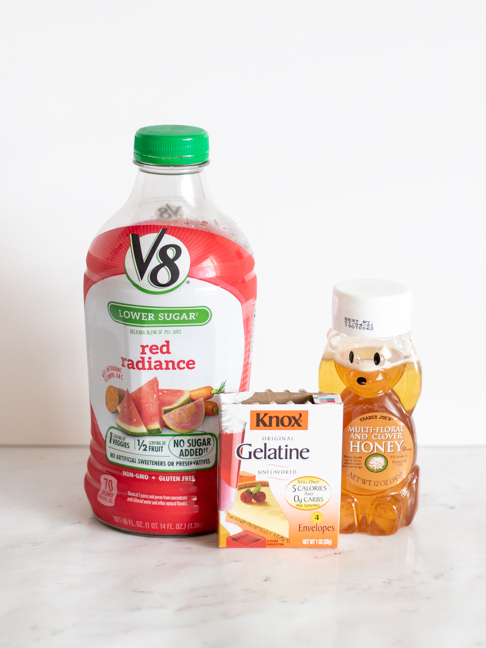 With fruit and vegetable juices like V8 and a little honey with gelatin, you can make your own healthy fruit and veggie gummies for kids to enjoy as snacks or vitamins. The fruits help overpower the flavors of the vegetables, so no one ever has to know there are veggies in it! You can even add extra vitamin powders or probiotics when making the gummies to help add even more nutrients! Thanks to the amount of real fruit juice in the juice mixture, the gummies just taste like you bought them from the store, but each bite is actually full of vegetable juice too, like carrots, spinach or sweet potato, depending on the juice you use. 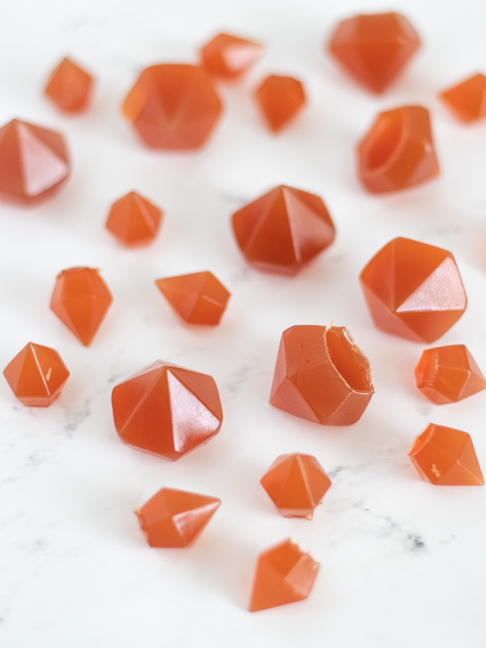 Here’s the easy recipe to make your own veggie gummies in any mold! Step 1: Measure and pour the juice into a small saucepan. Sprinkle the gelatin powder evenly over the top of the juice. Let sit for about one minute, then stir the gelatin mixture once the top appears wrinkly. Step 2: Heat the juice and gelatin mixture over medium heat, stirring often. Heat until the powder dissolves, but do not bring to a boil. Step 3: Stir in the honey and any desired supplements. Step 4: Pour the mixture into a measuring cup with a pour spout. Then pour into silicone candy molds to make shapes OR pour in a square loaf pan lined with parchment. Refrigerate 2-3 hours. Step 5: Once solidified, carefully remove the vegetable gummies from the molds. If using a loaf pan, pull out the whole piece and cut into squares with a sharp knife. 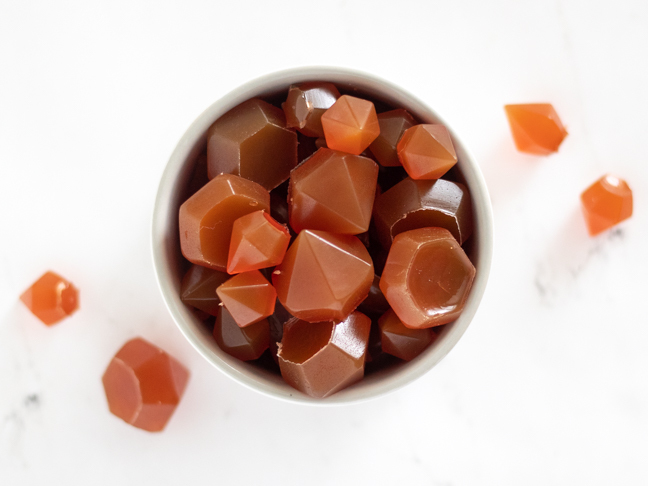 Store gummies in an airtight container in the fridge for up to 2 weeks. They may be kept at room temperature, but fridge is recommended.